Using dog nail clippers learning how to trim dog nails can seem a daunting and terrifying task for most pet parents. Unless you’re willing to take your dog to the groomer regularly to have their nails cut, now is as good a time as any to learn how to confidently and safely give your dog their routine mani-pedi! All you need is the right equipment, a steady hand and a couple of treats to make the whole exercise worthwhile for your dog! 3 Reasons Why Trimming Dog Nails is so Important! How Long Should Dog Nails Be For Trims? Clipping Dog Nails: How Often Should You Do It? A Step-By-Step Guide on How to Clip Dog Nails! Dog Toe Nail? Claw? Declaw? Can You Use Human Nail Clippers? Cutting Dog Nails: Can You Use A Dog Nail File? Dog Nail Bleeding? What Do You Do If You Cut the Quick! Keep That Styptic Powder Ready! How to Select the Best Dog Nail Clippers! Amazon Picks! Here Are The Best Dog Nail Clippers! Amazon Picks! The Best Dog Nail Grinders! Most domestic dogs that live in urban environments need their nails trimmed regularly. Working dogs, and those dogs that do get a lot of exercise outdoors, usually naturally wear down their nails and keep them trim. However, with your average pet, they tend to spend more time indoors or on soft surfaces that do not provide a natural filing effect. Dogs walk and balance on their toes. Those spongy little paw pads under a dog’s toes help them with navigating various surfaces, absorbing shocks, picking up speed, and protecting them from harm. If their nails are too long and extend over their pads, then your dog is putting the pressure of their weight on their nails and toe joints. In other words, they are standing on their nails instead of absorbing their weight through the pads on their feet. Long nails can also split, tear or turn and curve back into their pads. Whether for small dogs or big dogs, this is incredibly painful for them! When dog nails are untrimmed, dogs may adjust their posture to a crouch position and/or start spreading or twisting their toes apart to minimize discomfort. Long-term crouching and posture adjustments will affect your dog’s muscles, joints, and tendons. It can lead to arthritis and other health-related conditions. Long nails also make it hard for a dog to get the exercise they need to keep healthy and well. The correct length of your dog’s nails will depend on their breed, but if you can hear their nails tapping or clicking on a hard surface or they catch on the carpet, they are most likely too long. When in doubt, ask your vet. The pinkish area in their nail with the nerves and blood vessels is called the “quick”. The quick is easy to see on dogs with light nails or claws, but harder to see on dark colored or black claws. You want to keep your dog’s nails trimmed close to the quick as possible, but not into it. Dog nails are trimmed to a minimum of two millimeters away from the quick. Like ours, the nail at the end below the quick is dead. Using dog nail clippers can best do this, but cutting into the quick is painful for your dog, and will result in bleeding. How often you need to clip your dog’s claws will depend on how active they are, and what type of surfaces they exercise on. Other factors are whether they have dewclaws (see below for where to find this additional claw) and that the nails on their front feet may need more regular trimming than those on the rear. Most dogs’ nails need a maintenance trim of their nails around once a month. Try making a nail check part of your weekly regular routine, even if you are not cutting them at the time. This will help to get them used to having their paws handled. Give them lots of love. Positive reinforcement will go a long way toward relieving any anxiety caused by the sight of the dog nail clippers. It should always end with a big hug and/or a treat in order for them to associate their nail trim with good things. Familiarize yourself with how to use your dog nail clippers and trimmers before you start to make the job as quick and easy as possible for you both. If you don’t own any grooming equipment, you might want to consider the Ceenwes Dog Nail Clippers set. It has everything you’ll need, including clippers that are quiet, cordless and rechargeable! Make sure you have lots of light! Do your dog’s nail clipping outside in daylight or in a brightly lit room. If you need reading glasses or are worried about getting too close to the quick, wear magnification glasses so you can see how close you are cutting. Go gently and separate your dog’s toes with the fingers on your other hands. This will give you more space to use the cutters. If you have a hairy fur baby, trim back the hair around their toes with a pair of scissors. That way, you will have uninterrupted visibility and access to their claws. For small dog breeds, you may be able to trim their nails while they are sitting on your lap. With medium-sized dogs or larger dogs, you may find it easier and more comfortable to have them on a table. 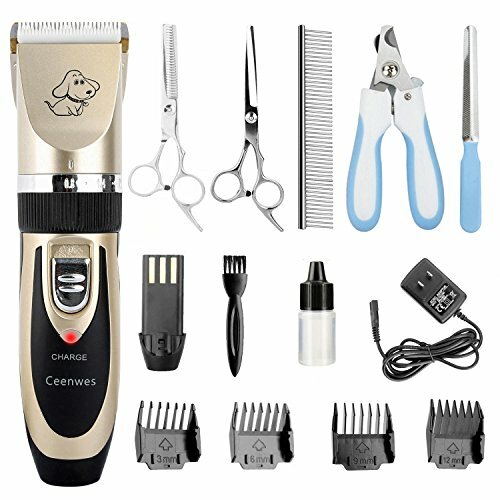 Ceenwes Rechargeable Cordless Dog Grooming Clippers set keeps your pets always looking good, it's very useful both in home and profession salon use! Complete new user friendly, with limiting comb this clipper ensure you a safe cutting and neat and tidy hair result. No more expensive bills for pet grooming and you can do it in an easy way. Pet hair clippers will provide you and your pets with excellent cutting experience. pet clippers for dogs With below 60db noise,Helping the pet feel at ease, not afraid haircut any more. All accessories are underneath the case on the bottom. please check and confirm it,thanks so much . Make sure you know how to use your dog nail clippers or trimmers and that the blades are sharp. Have any other bits and pieces you may need at hand, including something to stem any blood in case you do accidentally nip the quick. Cut from underneath your dog’s nail holding your nail trimmer and your dog’s paw so you can see the nail clearly. Particularly for dogs with dark claws where you cannot see the quick, it is better to make a series of small cuts gradually, checking the edge of the nail as you go. If your dog’s nails are overgrown you will most likely need to trim them back regularly a little at a time on a weekly basis. As nails get longer, the quick lengthens down the length of the claw at the same time so you cannot cut them all the way back on your first attempt. As you regularly trim back the nails on a weekly basis the quick will recede until you reach a comfortable claw length for your dog. If you have an anxious or nervous dog, desensitize them to the nail trimming process as much as you can before you attempt to make a cut. Even better, start desensitizing your dog to having their paws handled from a young age while they are puppies. Regularly massaging and touching their feet and paws. If you get your dog used to you touching their toes, it will be easier to trim their nails. Positive reinforcement will always go along with anything. Introduce your dog to the equipment. Lavish your dog with praise and a treat after you are finished. If you use an electric grinder or other equipment, turn it on beside you while you are grooming other areas so your dog gets used to the noise. If your dog is particularly noise sensitive, it might be worth investing in “quiet” equipment. Emitter has you covered with their Ultra Quiet Pet Nail Grinder for Dogs! Watch an expert. Take your dog to your vet or to professional groomers and see how they handle the process with your dog. Observe the techniques they use for holding the equipment and your pet. Some things are easier and friendlier with two, as said by Winnie the Pooh. Try making the nail cutting routine one that involves you and another family member or a friend. One person can be holding your dog and one cutting their nails. Two people may be able to make the task quicker, friendlier, and more efficient than just one – especially if you have a large dog. The dog nail grinder is designed to grind the animal paws after trimming the nail by the nail clippers. It takes longer time to grind the long nail of large dogs. If you are not satisfied with the speed of our dog clippers, please contact our customer support via for refund or replacement before leaving any negative review. We can guarantee that our dog nail grinder is high quality made, but it is hard to meet every customer’s expectation. Please just contact us directly for any after-sale service. ✔Diamond bit head last lifetime use, buy only one our dog nail grinder, no need to pay extra dollars in the future. Most economic choice here. ✔100% money back guarantee. LIFETIME. Yes, it’s Lifetime policy. 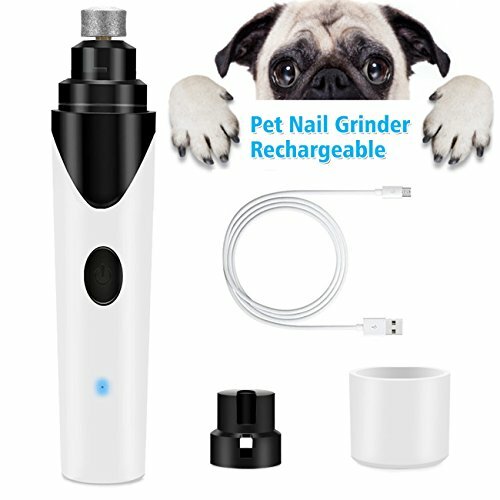 Once you purchase one pet nail grinder, you are covered 100% money back policy FOREVER. Have a try of our products, take no risk. ✔Three size ports for all breeds animals. One for all, so easy! ✔Quiet running, pets will hardly notice its sound. Perfect for pets use. ✔Universal USB port charging design make charge so convenient. ●Turn the pet nail grinder on and let him get used to the sound with praise and treat. If you are wondering whether dogs have nails or claws, technically they are called claws. Without getting too technical, the difference between a nail and a claw is what it is made of and the way it is shaped. Moreover, what a claw is made of is what makes it curl. Dog breeds have a minimum of 16 claws, four on each toe. If they have dewclaws, they may have an additional claw on all four legs or just their front legs. Dewclaws are the small claws higher up on the side of your dog’s leg. They are in a similar to the position where our thumbs come out of our wrists. Some breeders and veterinarians remove these, so if your dog does not have them, do not panic! If your dog does have them, they need to be added to your trimming regime. Even though they do not get the weight bearing pressure as your dog’s other claws, they can become long, sharp, and curl inwards. Trim away any long hair around their toes. Make sure your trimmer has a sharp cutting edge. Check you are not cutting into the quick. Cut from the bottom edge of their nails. Give your dog treat at the end! Nope, you might be tempted, but you should not use human nail clippers on your dog. Nail clippers for people are designed for a human-shaped nail, not a dog’s claw. You need clippers shaped for pet nails to minimize the risk of cutting into their quick by accident. Yes, you can use a dog nail file. Using a nail file will smooth off the cut surface and make sure there are no sharp edges that your dog may snag on surfaces. Desensitize your dog to a nail file just as you do with the dog nail clippers or trimmers. For some, humans included, the sound of nail filing may be akin to fingernails on a blackboard! You might want to consider using something like the Hertzko Electric Pet Nail Grinder. It makes the filing process much quicker! It’s incredibly easy to use, easy to clean, rechargeable, and best of all: It’s really quiet! No need for anyone to get anxious from a sensory overload! If you have a look at clippers such as the Bonve Pet Dog Nail Clippers, you’ll see that they are specially designed for dog nails. These clippers, like any other you should consider to use, have a safety guard and have sharp blades made of stainless steel. The last thing you want is to use blunt, rusty equipment! If your dog has black nails or very dark nails you will not be able to see the pink blood vessels and nails inside the nail like you can with light colored nails. Make sure your trimmer has sharp blades for a clean cut and have your gear ready before you start. 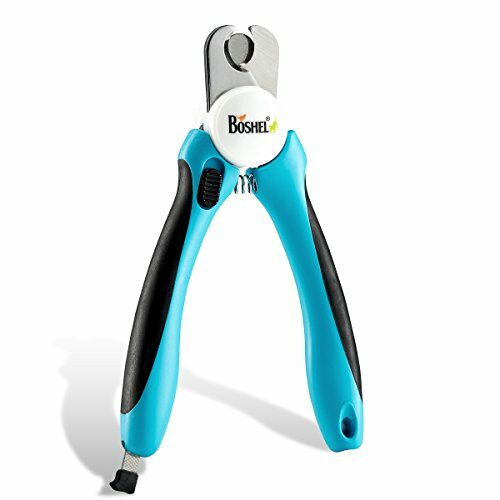 The Boshel Nail Clippers and Trimmers have a safety guard that help to prevent you from cutting to far into your dog’s nail. It’s easy to use with its non-slip handles, and its sharp blades mean you’ll always make a clean cut! Only cut very, very small pieces off each nail at a time. Check the cross-section on the cut edge each time. If you see a black spot in the center, stop. This is getting close to the quick. Gently file away any rough edges if needed. If you are feeling overwhelmed, talk with your local groomer, vet, or breeder about the best type, and approach for your dog. Many will let pet owners observe them so you can learn by seeing how they do it. Get your dog used to a nail check and trim as part of your regular grooming routine and they will be happier and healthier in the long term. If you would prefer not to buy or use your own professional dog nail clippers, you can have a groomer or your local veterinarian clinic trim your dog’s nails for you. A good place to start if you are looking for dog nail trimming services is the groomers listed with the American Kennel Club (AKC) marketplace. Even with experience, sometimes dog owners cut the quick. If your dog’s nail does start bleeding, there is no need to panic yourself or your pup. You will need to stem the bleeding, which will usually stop in less than five minutes. The best way to treat the bleeding of any quick accidentally snipped is with Styptic Powder, and some tissues or a clean cloth. 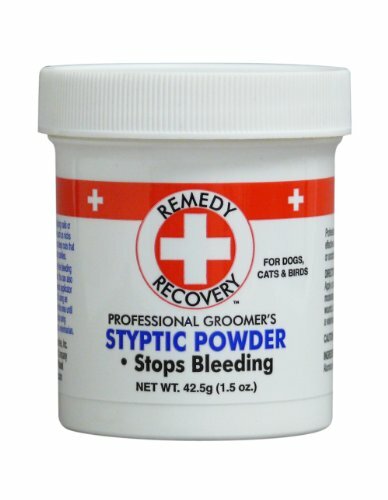 Styptic Powder helps the wound to close. There are a lot of brands to choose from, but the Cardinal Laboratories Remedy and Recover Styptic Powder has been tried and tested and has not been found wanting! Selecting nail clippers for dogs will largely be a matter of preference. Some find scissor type clippers easier to use, while others prefer the guillotine design. Whichever type of grooming tools you use, the most important thing is to make sure the blades of the dog nail clippers are clean and sharp. Some models have angled heads, safety guards, and specially shaped blades and non-slip grips to help with avoiding the quick and fitting against your dog’s nail. Scissor Clippers: These clippers work with a scissor-style operation, just as they sound, although the blades are shorter than standard scissors. Guillotine Clippers: These have a hole at the end that you put your dog’s claw through. As you squeeze the handles, the blade cuts through the nail. Grinding Dog Nails: These are electronic and use a type of sandpaper or emery board to grind away your dog’s nail at high speed. For various types of stainless steel pet nail clippers, and guillotine nail clippers, check out these products and their reviews on Amazon. The reviews will help guide you to choose the products that will work best for you and your dog! If you are thinking of using a pet nail grinder, check out the different options available on Amazon. You’re sure to find the perfect one for you, your dog, and your budget! Styptic powder should be a staple in every home. Especially in one with dogs! There are so many brands to choose from. Just make sure that you choose a pet product that is meant for use on dogs! Safety first! If you spend a little time desensitizing your dog to the task of nail clipping and make it a positive experience for them it does not have to be hard. If they have had a negative experience with nail trimming, try using a different type of clipper next time. Start them young; give them lots of love and treats to reward them after the job is done.